Congratulations to both my hometown teams! The New York Mets clinched the NL East two nights ago, for their first division title in 18 years and their first trip to the playoffs since 2000. The New York Yankees clinched the AL East last night, their 9th straight division title. Congratulations and good luck to both of them! I have never been a Mets fan; when I was a kid I hated them because that's what I was supposed to do. But now, having been an ex-patriate New Yorker for such a long time, I have come to understand that that the Mets represent my city just as much as the Yankees do, and so I do not root against them. And this year they have the added pull for me of being led by manager Willie Randolph. Willie Randolph had a great career with the Yankees as a player and, later, as a coach in Joe Torre's staff on some of the great Yankees teams of the last decade. Willie wanted to be a manager, and interviewed and was passed over many times before the Mets gave him a chance. I bet they aren't sorry they did. I'm rather hoping for another Subway Series this year - how can I not be? - and of course I'll root for the Yankees to win. 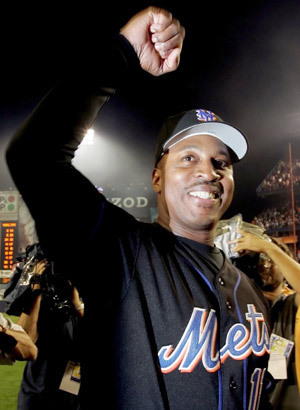 But I can't say I'll be completely heartbroken if Willie Randolph's Mets win it all this year. Here's to a great October for both teams.